Quality sod provides the foundation for a beautiful lawn, field, or other application. Choosing the right sod company for your environment means choosing local. At Country Green Turf Farms we deliver Northwest resilient sod grown from our custom mixtures. We use grasses that thrive in an oceanic climate and offer mixes that are perfect for lawns, sports fields, and mixed applications. The best sod in Edmonds can be found right here. There are some major benefits to choosing sod. Consider the following before you do any DIY seeding. Sod is guaranteed and fully mature. The greatest advantage of sod is that its quality is guaranteed. If you’re seeding a lawn or field from scratch you aren’t guaranteed to get the full, healthy, and vibrant grass you’re after. You may end up with bare patches which can be unacceptable for certain sports. A seed mixture that hasn’t been fine tuned for the Northwest environment may appear to do well then die off after too much rain or sun exposure. We fully fumigate our fields. Fumigation takes work but delivers the results you’re looking for. A sod company that doesn’t fumigate is risking your grass and providing an inferior product. There are a wide range of pests that can destroy a lawn before it even has the chance to grow. Fumigation eliminates these pests from the equation. The right grass for the application. Our sod experts will help you choose the right mixture for your lawn. Whether you’re located near the coastline by Marina Beach Park or further inland near Edmonds Community College, we’ve got mixtures specifically designed for your needs. Reduce costs from the very beginning. We don’t just provide sod for specific applications, we reduce costs at a large scale. 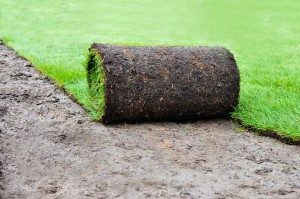 We have the equipment and expertise to lay out big roll sod. This is ideal for large applications and lays down sod at a greater rate with less labor. We’re a family owned company that first entered the sod market in 1988. That initial 5-acre patch has expanded to more than 660 acres and a reputation for delivering the area’s best sod and sod installation. When you need a gorgeous lawn you know will arrive healthy, beautiful, and resilient, there’s no better choice. We’ve always got stock in so there’s never a wrong time to call for sod. Get the lawn you want without the risk. Call or contact us today.